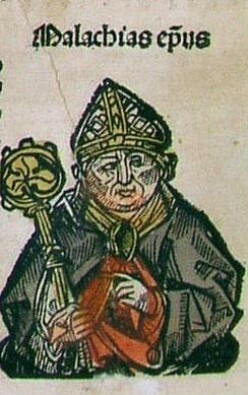 Woodcut Illustration, Nurenberg Chronicles, 1493 A.D. The resignation of Pope Benedict XVI surprised many people and caused a fair amount of interest in the secular media. I was particularly surprised to hear a local talk show host (a former football player) talking about the prophecies attributed to Saint Malachy—how the next Pope would be the last Pope, and that during his reign the city of Rome would be destroyed, and the events of the apocalypse would begin. More than one of our parishioners asked me about what we should do to prepare for all of this. Peter the Roman who will nourish the sheep in many tribulations; when they are finished, the city of seven hills will be destroyed, and the dreadful judge will judge his people. The end. For those who don’t want to see the end of the world, it is pleasant to note that a number of scholars argue that Saint Malachy did not actually write the catalog of phrases attributed to him, but a later author made them up and attributed them to Malachy, hoping to make them seem authentic. Saint Bernard of Clairvaux, a close friend of Malachy makes no mention of the prophesies in his biography of Malachy. Saint Malachy died in 1148, but the list wasn’t published until 1595, some447 years later. That, of course, is possible, but the phrases seem to do a better job of predicting the Popes up until the late 1500s than they do afterward. The suspicion is that they are a forgery, written by someone who had the benefit of 400‑odd years of history with which to compose phrases. There is also a problem with matching the phrases with the correct Popes. I once read something, written during the Second World War, that tried to make Pope Pius XI the next to the last Pope. on the theory that Adolf Hitler was the Antichrist, and would usher in the end of the world sometime around 1950. Needless to say, this writer was wrong! The Catholic Church teaches, through Its mystical theology, that revelations after the death of the last Apostle must be examined with great caution. Revelations to private individuals—visions, apparitions, locutions, or whatever—have three possible origins. They may be from God, or they may be from the devil, or they may have a perfectly natural origin—like a lurid dream caused by bad digestion. The person claiming to have received the revelation is probably the least qualified to judge its authenticity, and such a judgment can only be made by the bishop of the diocese in which it occurs—and only after careful investigation. When the Church “approves” a revelation, It says nothing more than “the claimed revelation does not contradict the Catholic Faith, and the one claiming to have received the revelation seems to be of sound mind, and has no motive to profit from the revelation.” The Church has no way of guaranteeing that the revelation actually happened. Revelations, like those of Fatima and La Sallette, have been declared “worthy of belief.” One may believe them if convinced, but belief is not mandatory, for the Church has no way of guaranteeing their authenticity. The Catholic Church has granted no similar “approval” to the prophesies attributed to Saint Malachy. We must also consider that our Lord explicitly told us that “of that day and hour no one knoweth, not the angels of heaven, but the Father alone.” And elsewhere, later in the same Gospel, “Watch ye therefore, because you know not the day nor the hour.” We simply don’t know when the end of the world will come! But, in a very real sense, we know that our own personal “end of the world” will come at some unspecified time in the near future. Some day—and it may be completely unexpected—our life on earth will be finished, and it will be judgment day for us. Even a very young and very healthy person might meet an untimely death. Accidents do happen! But, while our end may come without warning, it should never be without preparation on our part. We have no right to think that our death will be in bed with a priest at our side for a last minute repentance and sacramental Confession. The normal state of things for Catholics should be always to remain in the state of grace. Get to Confession regularly, avoid deliberate mortal and even venial sins, receive Holy Communion as frequently as possible, and maintain a regular prayer life. Make a regular examination of conscience—and get to Confession promptly when you have some serious sin to confess.